Do you have an active lifestyle? If so, you need a jacket to match. A jacket you can wear from town to trail, all day and every day. A jacket like the Mens 365 Exposure Jacket . 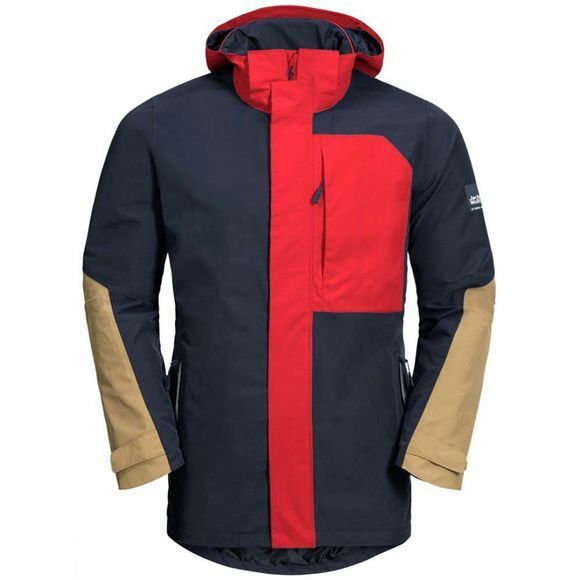 This jacket is tailored from Texapore Ecosphere, our environmentally friendly weatherproof fabric made of 100% recycled polyester. It is totally waterproof, windproof and so breathable that you'll feel great in it all day long. But the best thing about it is, it feels like cotton, so the wear comfort is superb. The hood can be detached and stashed in your pack for emergencies. The wide storm flap on the main zip and the slightly longer cut provide extra protection from the rain and wind. The jacket is part of our JW365 collection, a signature range of products created for an active lifestyle between the office and the outdoors. If you're looking for a youthful, confident style, a stand-out design, full-spec Jack Wolfskin technology and a combination of outdoor functionality and everyday suitability, these products were made for you.